As promised in my last post, I am returning to leave an update on the remaining 7 Stanes trail centres, or rather what happened in my quest to ride them all. As planned, I decided to start with Dalbeattie the day after riding Kirroughtree. 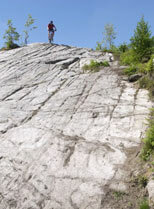 Dalbeattie trail centre red course is 25km in length, comprising 65% single track. I arrived late morning and there seemed no end to the rain. I got changed, set up the bike and as if by magic the rain stopped just as I was about to hit the trail. So far so good! 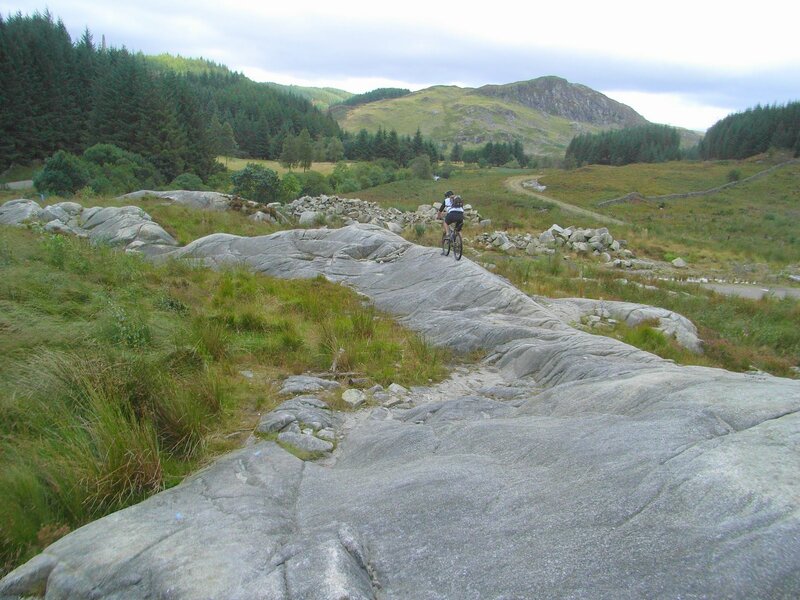 I was riding along steadily enjoying yet another top class Scottish trail centre and was eagerly anticipating “The Slab”, a daunting 15 metre section of exposed sheer granite rock face lying at a steep angle, described as the highlight of the trail. After about 1/2hr I reached this point and to be on the safe side got off the bike and looked over the edge to scan for the best line. Back on the bike and time to take the plunge. The rock surface was very wet which didn’t help the tires grip much. Speed picked up quickly, but the line was good. Just near the bottom I hit a lip and before I knew it I was heading down, down, down before I landed on the trail path with a bang. I picked myself up and completed a split second damage assessment in my daze: Wrists hurt, knees hurt… actually left wrist really hurts! Hold on, how is the bike? Nothing broken, thank goodness! So where was I again? 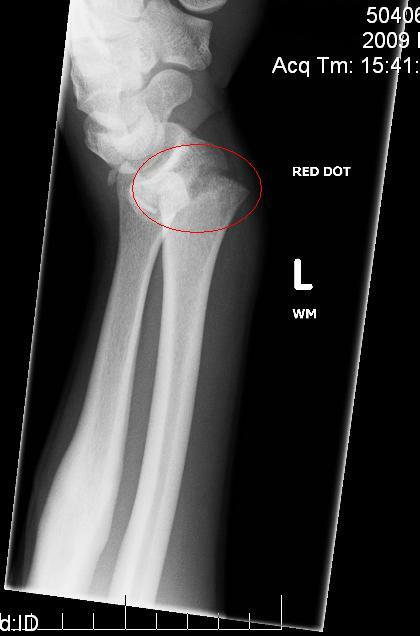 Oh yeah, that severe pain in my wrist… Mmmm, it’s a bit crooked as well. Yep, it’s definitely broken. So I walked down a short section of single track and hopped back on the bike once I reached the fire roads again and cycled the 2km short cut back to the car park. Got the bike loaded into the car and drove to Dumfries hospital with my floppy wrist. Into A&E and registered – The great thing was, all my details were already on the system, as I had been mountain biking once previously in Dalbeattie for a Scottish NPS XC race back in 1997, had also crashed, and finished up in Dumfries A&E. After a short wait, I was seen to by the friendly and efficient medical staff. Diagnosis was quick considering the obvious deformity where upon they quickly moved to the next step – Pain reduction for comfort. Dr: How sore is it? Dr: Would you like some pain killers? JK: Yes please, that would be nice. Dr: No problem at all, I will get some morphine for you now. 2mins later and all my discomfort and worries were on hold. A couple of x-rays to assess the extent of the damage, followed by some more morphine and a manipulation under a local anaesthetic, the application of a plaster cast, some more x-rays to check proper alignment and I was ready to settle down for the night. Next day I was released, already scheming my comeback and determined to make it third time lucky in Dalbeattie. On Saturday I rode the Ae trail centre red course. 24km in length, comprising 65% single track, it is a solid 1.5 hour ride (even though the shop manager was unconvinced it was possible before I set off). He even offered me a free meal, well a recovery bar, if I lapped in less than 1.5 hours. Exactly 1h29m44s later I cruised in to pick it up, including negotiating the last downhill in falling darkness without lights! Not recommended for minors – Do not try this at home! Flooding on the path just after the very start led to the latter 2 thirds of the ride being completed with no feeling in my feet, which detracted somewhat from the comfort factor of the ride. Today I rode the Kirroughtree trail centre black course. 31km in length (17km red with 14km black section) with 75% single track, it is a physical 2 hour ride. Arguably one of the best trail centres in the UK, the highlight has to be McMoab, huge slabs and ridges of exposed granite, linked by boulder causeways. A good technical level of riding skills is necessary to negotiate this feature, especially in the wet. Over the next couple of days I will be riding Dalbeattie, Mabie and Glentress & Innerleithen trail centres with updates to follow. You are currently browsing the Janos Köhler's Blog blog archives for November, 2009.